I’ve memorized the keys you have to hit for United Airlines to get to an operator as fast as possible. With other companies I just keep saying “operator” while hitting # over and over again. Sometimes it works. With Bringo, none of that matters any more. You don’t even need to dial your phone. Just find the company you want to talk to in their directory, type in your phone number, and a couple of minutes later Bringo calls you and connects you to an operator at that company. 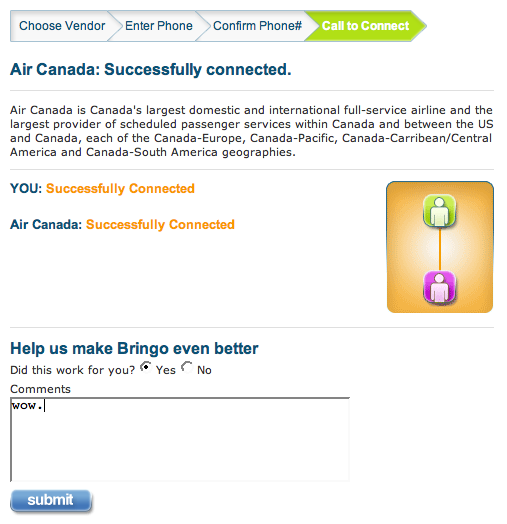 I tried it with Air Canada and it worked absolutely perfectly.